TOD - since 2007 the situation really hasn't changed much. The process is quite energy intensive, and thus will use up coal supplies faster. The process is quite expensive, and can be expected to continue to be quite expensive, even as experience is gained in the process. Overall such processes raise the energy costs to produce the same amount of electricity in a cleaner way by 24-40% for new (supercritical) conventional coal plants using the post combustion approach and by 14% to 25% for coal based Integrated Gasification Combined Cycle (IGCC) systems using pre combustion. If we reflect the impact of the additional 425 million tons on coal production forecasts, the effects on available energy from coal become clearer. 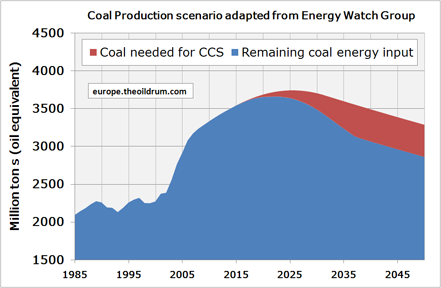 For this I have taken the coal production scenario from the German Energy Watch Group (pdf), released a few months ago. In this scenario peak coal production is expected around 2020-2030 with at slow declining slope. ...Furthermore the decline is much faster after the peak.